Yes lovely readers I am up before 8am doing a blog post on a Saturday morning? Why? or more accurately WTF? Well today is my last class at CPIT and this is the day we do our presentations, part of our assignment. I spent ALL NIGHT dreaming about mine so got up extra early to rewrite it and then decided it was actually OK after all. Our exam is on Wed and then after then I get my life back again (hopefully!) – I still have study to do but have a lot more time and less pressure. Plus the road workers in the street were up extra early, the whole house is shaking and shuddering with them smashing equipment into the ground, its very loud and the cats are a bit freaked out. So here is a lovely cloudscape I took on my way to St Bathans, driving down a long shingle road with this fabulous sky. When I saw this farm equipment parked on the side of the road, I stopped and got out of course, it was the perfect foreground to the farmland and the wonderful sky. Wish me luck for my presentation, and hopefully after Wednesday, normal blog transmission will resume, I have HEAPS of photos from Tasmania to work on still! 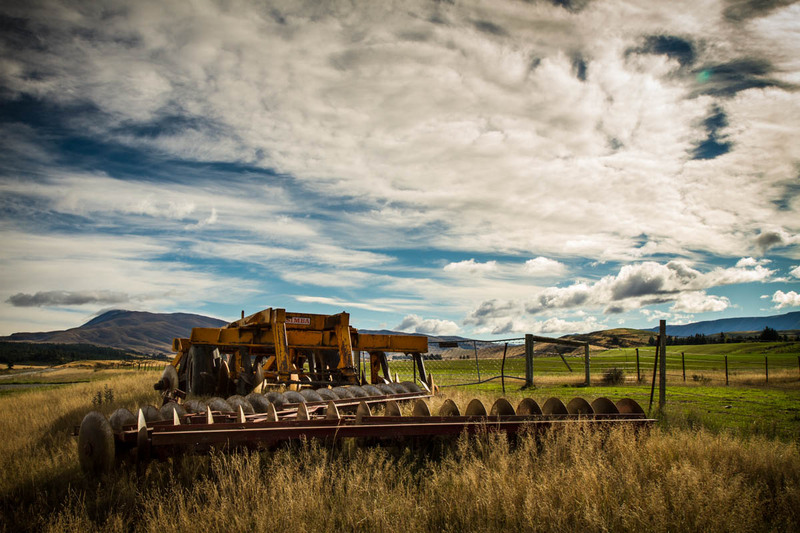 This entry was posted in Camera Adventures, Waffle and Burbling and tagged cloudscape, landscape photography, maniototo, nz landscape, nz scenery, photography. Bookmark the permalink. All the best for your presentation! Thanks Sue, in the end it went pretty well and Im hoping for an A for the overall score which would be nice. Exam on Wed and then all the study done for a couple of months. Great, then you can have a rest. Just lovely! I am a ‘cloud freak’ and am constantly telling my husband ‘pull over – Just give me time to get a few shots of those awesome clouds’! OR, if that fails, I just roll down my window and take photos as best I can! I love to play with them using Picasa – tinting, cropping and using different ways of presenting them. I usually frame them as well with Picasa. And YES!! I save the originals – didn’t at first and lost a few to that! Thanks for sharing this great photo! I forgot to add that the contrast between the beautiful blue and white sky and the gold and green of the forefront is quite striking. AND, good luck on your presentation! Nice work. All the best for your presentation and look forward to seeing more of your work. Thanks Raewyn, presentation went very well so Im hoping for an A for that part. Just have the exam on Wed but the pressure is a little easier because its been declared an open book! Thanks for the explanation. Is this the last year? Fantastic image! Best of luck on the presentation.